The people of Earth live in a society where vampires aren't just real but dangerous. Although humanity has been able to keep them under control and even take the night away as the vampire's natural habitat, some of them have adapted. Hesperides, a relatively new breed of vampires, have adapted over hundreds of years in order to be able to go outside during dusk when the sunlight is at its weakest and feast on humans. Aburaya Shiro, a high school kid, lives in a town where there has not been a vampire attack in years, but adults keep warning them of going outside at dusk. Shiro and his classmates take this warning lightly and head out at dusk only to find out one of their classmates who they thought they knew well turnz out to be a Hesperides. With all his classmates violently murdered, the only way Shiro was able to survive was with the help of a different classmate, Ichijoji Eruka, who doesn't seem to be human herself. 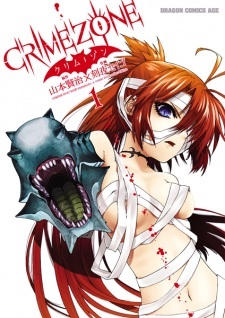 Crimezone was published in Italian by Panini Comics under the Planet Manga imprint from June 14, 2014 to February 28, 2015. Crime Zone has a pretty weak main character that seems to be in tears most of the time, but he is put through a lot very quickly. The story isn't super gory, but there are lots of bloody moments. The story line is interesting and intense. The battles take up a fair chunk of the story and the characters are merciless. It's a story where you will bite your nails in shock at some of the extreme moments. It's a good story if you like a strong, determined female character and a normal guy thrust into a crazy situation. I can't wait for more chapters!